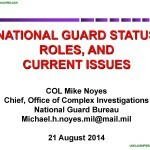 A presentation from August 2014 outlining roles and basic information about the authorities and roles of the National Guard under Title 32. 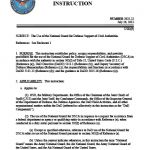 This instruction establishes policy, assigns responsibilities, and provides procedures for the use of the National Guard for Defense Support of Civil Authorities (DSCA) in accordance with the authority in section 502(f) of Title 32, United States Code (U.S.C.) 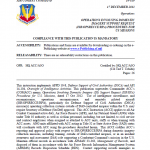 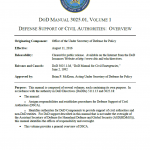 (Reference (a)), DoD Directive (DoDD) 5111.1 (Reference (b)), and Deputy Secretary of Defense Memorandum (Reference (c)); the responsibilities and functions in accordance with DoDD 5111.13 (Reference (d)); and the guidance in DoDD 3025.18 (Reference (e)). 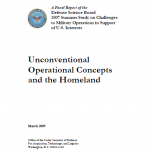 This report on unconventional operational concepts and the homeland was prepared as part of the Defense Science Board 2007 Summer Study on Challenges to Military Operations in Support of National Interests. 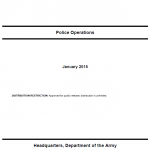 The summer study recognized that asymmetric tools of war in the hands of potential adversaries may well be employed using non-traditional concepts of operation. 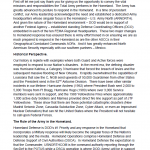 Moreover, the battlefield may no longer be limited to regions afar, but may include the U.S. homeland. 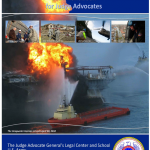 The United States could well confront the possibility of going to war abroad in the face of significant devastation in the homeland—dividing forces between homeland catastrophe relief operations and combat abroad, or even facing the possibility that deploy and supply of U.S. military forces could be delayed and disrupted. 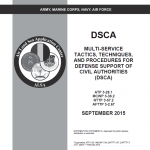 Defending U.S. territory and the people of the United States is the highest priority of the Department of Defense (DoD), and providing appropriate defense support of civil authorities (DSCA) is one of the Department’s primary missions. 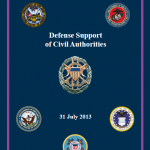 This Strategy for Homeland Defense and Defense Support of Civil Authorities orients the Department towards an increasingly complex strategic environment. 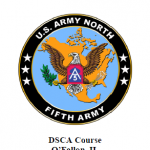 It emphasizes innovative approaches, greater integration, deepening of external partnerships, and increased effectiveness and efficiencies in DoD’s homeland activities. 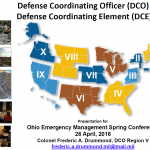 It applies the vital capabilities of the Total Force – in the Active and Reserve Components – to make the nation more secure and resilient. 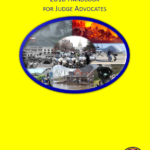 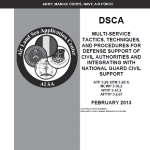 Finally, the Strategy guides future decisions on homeland defense and civil support issues consistent with the Defense Strategic Guidance and the Quadrennial Defense Review (QDR).